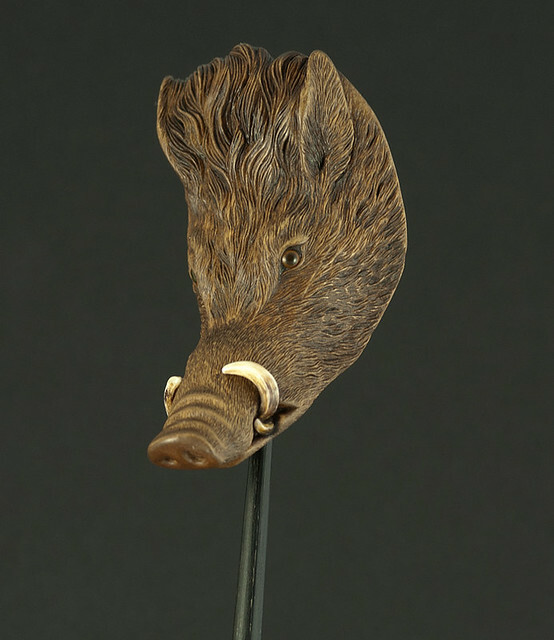 A study of a boar's head, masked netsuke carved from boxwood.To manually move the slideshows, hover mouse over the main image, click the left hand square and use the arrows. A horn snail moves over a patch of lichen rendered in boar's tusk inlays. Horn snails on an umimatsu log with boars tusk bracket fungus inlaid. Entitled 'Homage To Tessai' this representation of a dried salmon is carved from bleached Asian water buffalo horn. A brown trout carved from fossil walrus tusk under a river bank crafted from umimatsu with various mother of pearl inlays. A clownfish amongst an anenome carved from mammoth ivory with double inlay mother of pearl eyes.